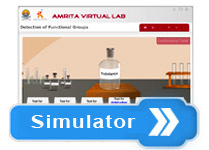 Systematically identify the functional groups in the given organic compound and perform the confirmatory tests after identifying the functional groups. Amides are decomposed by NaOH to evolve ammonia. The gas can be tested by a moist red litmus paper which is then turned blue. The soluble sodium salt of aromatic acid formed from aromatic amides upon hydrolysis is regenerated as white precipitate in acidic medium. When aliphatic diamide is heated at a temperature above its melting point, ammonia is evolved and crystalline biuret is formed. This biuret in alkaline medium gives a violet colour with a drop of copper sulphate solution. Hydrogen peroxide reacts with aromatic primary amides to form the hydroxamic acid, which then reacts with ferric chloride to form ferric hydroxamate complex having a violet colour. Carboxylic acids being acidic dissolves in NaOH to form sodium salt. Forms salt with sodium bicarbonate solution with the evolution of carbon dioxide. 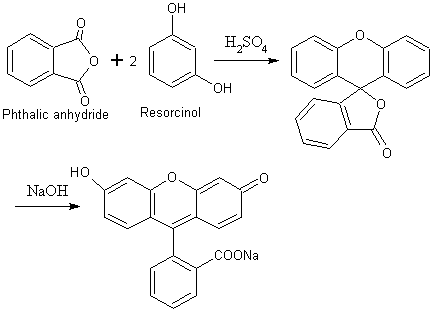 The anhydrides of aromatic 1,2-dicarboxylic acids on heating with resorcinol gives a dye fluorescein. This dye in NaOH solution gives a yellowish red solution with green fluorescence. Aromatic 1,2-dicarboxylic acids decomposes to give its anhydride when heated at its melting point. Phenol form characteristic coloured iron complexes when treated with neutral ferric chloride solution. E.g. phenol & resorcinol - violet colour, catechol-green etc. Aryldiazonium salts react with aromatic rings of phenols to form highly coloured azo compounds. These reactions are called coupling reactions. Phenols react with benzoyl chloride in presence of NaOH, to form esters. 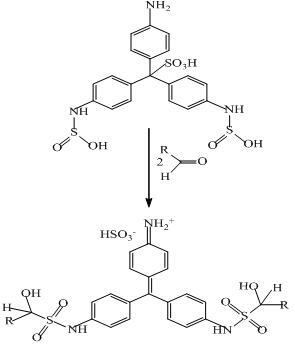 At low temperature (0-5oC) aromatic primary amines dissolved in strong acids (HCl & H2SO4) reacts with nitrous acid (NaNO2 +HCl) to form water soluble diazonium salts. Aliphatic primary amines do not form stable diazonium salts under similar condition. They react with nitrous acid to yield alcohols and nitrogen (causes rapid foaming). Primary aromatic amines react with benzoyl chloride in presence of NaOH, replacing the H atom attached to the N atom with the benzoyl group to give anilides. Hinsberg reagent is called benzenesulfonyl chloride. Primary aliphatic amines on reaction with benzenesulfonyl chloride & NaOH gives N-alkylsulphonamide which contains an acidic hydrogen and hence dissolve in NaOH solution to form the soluble sodium salt. The solution thus obtained on acidification gives a precipitate of free sulfonamide which is insoluble in HCl. Schiff’s reagent is a red solution of rosaniline hydrochloride dissolved in water which is decolourised by passing sulphur dioxide. Dilute solutions of aldehydes when added to Schiff’s reagent restores its red colour slowly. Aldehydes reacts with 2,4-dinitrophenyl hydrazine solution to give a orange/red precipitate of aldehyde 2,4-dintrophenylhydrazone derivative. Aldehydes are oxidized to carboxylic acids accompanied by the reduction of silver ions to metallic silver which appears as a mirror under proper conditions. Saturated solution of sodium bisulphite in water, when mixed with aldehydes gives a white crystalline bisulphite addition compounds. Ketones reacts with 2, 4 dinitrophenyl hydrazine solution to give an orange/red precipitate of ketone 2,4 dintrophenylhydrazone derivative. The nitroprusside ion, which may be regarded as a special carrier of the nitrosonium ion, forms a coloured complex with methyl ketones. In presence of alkali eg acetone is converted to CH3COCH2- ion which reacts with nitroprusside ion [Fe(CN)5NO]2- to give highly coloured ion [Fe(CN)5NOCH2COCH3]2-.
i) A little of the substance is boiled with dil. NaOH. ii) Substance is boiled strongly with 20% NaOH solution. Then cooled & acidified with dil. HCl. To a few ml of the saturated NaHCO3 solution taken in a test tube, a little of the substance is added. Brisk effervescence with the liberation of CO2. To a little of the substance in water or alcohol a few drops of neutral FeCl3 solution is added. Violet colour. Presence of phenols. A little of the substance is added to 1ml of the Schiff’s reagent. Violet colour developed within 2 minutes. Presence of aldehydes. 5 Action of Borsche’s reagent. A little of the substance in methanol is heated with few drops of Borsches reagent in a water bath. A yellowish orange ppt. Presence of aldehydes or ketones. Dissolve a little of the sample in 2ml con HCl diluted with water& cool in ice. Dissolve sodium nitrite in water & add the solution dropwise to the cold solution nitrite in water & add the solution drop wise to the cold solution. Rapid foaming. Presence of primary aliphatic amines. A little of the substance is boiled with few drops of Tollen’s reagent. Add a few drops of sodium nitroprusside solution to few drops of ketone. Then add NaOH solution in excess. A little of the substance is heated with Conc.H2SO4 & Resorcinol in a dry test tube. It is cooled & then poured into a beaker containing excess of NaOH. A red solution with intense green fluorescence. A little of the acid is heated in a dry china dish covered with an inverted funnel whose stem is closed. It is then cooled. White shiny needles are deposited on the sides of the funnel. A little of the substance is heated first gently in a dry test tube followed by strong heating. The solid residue is warmed with1 mL 10% NaOH then cooled and one drop of dil.CuSO4 added. On heating smell of ammonia is evolved & violet colour on adding CuSO4. Place a little of the substance in 5mL water. Add few drops 3% hydrogen peroxide and 2 drops of 5% ferric chloride. Heat the solution. Presence of aromatic primary amide. Add 2mL of cold diazonium solution to a solution of 0.1g 2 -naphthol in 2ml 10% NaOH. & 5 mL water. Dissolved a little of the substance in 10mL 10% NaOH solution contained in a boiling tube. About 1mL of benzoyl chloride is added. The boiling tube is corked and shaken vigorously for about 15 minutes. A white ppt is formed. To 0.3 mL or 300 mg of unknown substance in a test tube add 5 mL of 10% NaOH solution and 0.4 mL of benzenesulfonyl chloride. Close the test tube with a cork and shake the mixture vigorously. Test the solution to make sure that it is still alkaline using litmus paper. Presence of aliphatic primary amines. Cool the solution & add 10% HCl solution dropwise. Dissolve two drops of aniline in 1 mL dil.HCl well cooled in ice. Few drops of saturated sodium nitrite solution are added. Then it is added to a well cooled solution of the phenolic compound in aqueous sodium hydroxide. A red coloured substance is formed. Dissolved a little of the substance in 5mL 20% NaOH solution contained in a boiling tube. About 1mL of benzoyl chloride is added. The boiling tube is corked and shaken vigorously for about 15 minutes.